Toastmasters International is the world’s leading organization devoted to the improvement and development of individual communication and leadership skills. 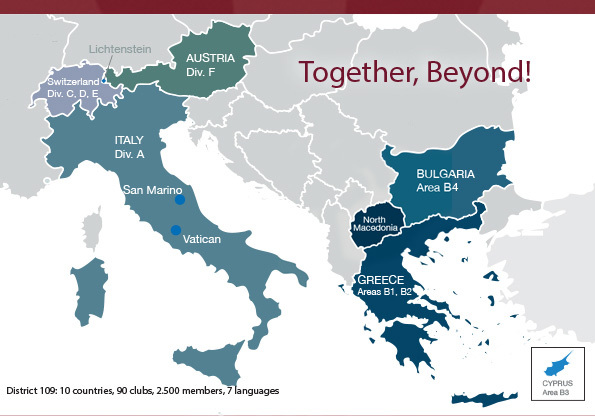 Toastmasters District 109 consists of over 97 clubs (24st January 2019) across Austria, Bulgaria, Cyprus, North Macedonia, Greece, Italy, Liechtenstein, San Marino, Switzerland and Vatican City. Each group of three to six clubs are taken care of by an Area Director who visits them and builds the bridge to the district. Three or more Areas can be group in a Division. A Division Director is the team leader for the Division´s Area Directors. He/She reports to the District Director.